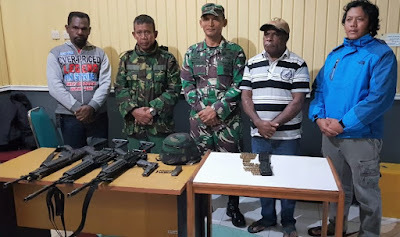 Reported from Haipapua, four firearms belonging to TNI members who were seized by armed separatist criminal groups (KKSB) in Wege Muka District were finally returned by the TNI to the Wege Muka District, at the Enarotali Guest House, Paniai Regency, Tuesday (08/08/2018 ) early days. 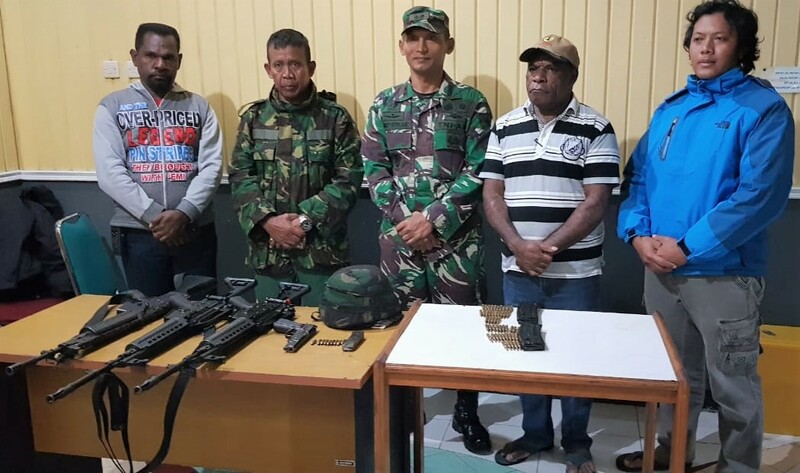 Head of Information of Cenderawasih XVII Kodam, Col. Inf Muhammad Aidi confirmed the return of 4 firearms which had been seized by KKSB from TNI members who escorted the Bright Papua Survey Team in Bokoa Village, Wege Muka District, Monday (6/8/2018). "The four weapons were delivered by Wege District Chief Muka Deki Gobay accompanied by Wege Bino District Chief Robi Degei who was handed over directly to the 1705 Paniai District Military Command Lt. Col. Jimmi Sitinjak on Tuesday (7/8/2018) at around 2:35 p.m.," Aidi said in his written statement, Tuesday (07/08/2018). Deki admitted that the attack was triggered by miscommunication between district officials and the Bright Papua Survey Team. Deki emphasized that the community really hopes that this bright Papua program can be realized soon. "People are very dreaming of electricity programs going into their villages. Therefore, knowing this incident, his side and the community immediately requested that the KKSB immediately return the weapons, "Deki said. Deki claimed to have been greatly helped by various activities of TNI soldiers in Paniai and Nabire. Therefore, he and the community tried to persuade the youth involved in the attack to immediately return the 4 firearms. "We say an apology because those who do the activities are our children who need to get a loan," Aidi said, quoting Deki's statement before a Forkopimda Paniai representative. Dandim 1805 Paniai Lieutenant Colonel Inf Jimmi Sitinjak expressed his gratitude for the assistance of the Wege Muka District Head. "We will try to help the program from the Government to be immediately felt by the people in the Wegemuka District," Aidi said, quoting Jimmi's statement. According to Aidi, 4 firearms were seized by KKSB namely one long barrel type SS1 V3, two long guns SS2 V4 type with 50 rounds of ammunition, and one Pindad P1 pistol with 10 grains of ammunition, and bulletproof helmet . The weapon was seized by KKSB from TNI members who escorted the Bright Papua survey team in Wege Muka District. As a result of the KKSB attack, 5 members of the TNI who escorted the survey team were injured and are currently being treated at the Paniai Regional General Hospital. "Cenderawasih Regional Military Command urged KKSB members to go down the mountain, together to build the Land of Papua. He is concerned that the development of the next generation of Papua will continue to grow in conditions of conflict, "said Aidi. Also present in the handover of this weapon, the Acting Regent of Paniai Musa Isir, the Enarotali Mayor Danramil Inf Junaid, and the Paniai Police Chief of Intelligence Ipda Jhon.